(Nanowerk News) Researchers at the Okinawa Institute of Science and Technology Graduate University (OIST) have eliminated problematic pinholes in the top layer of next-generation solar cells in development. At the same time, they have significantly improved the lifetime of the solar cell and made it thinner. The findings were recently published in Scientific Reports ("Substantial improvement of perovskite solar cells stability by pinhole-free hole transport layer with doping engineering"). Atomic Force Microscopy (AFM) images show pinholes in the spiro-OMeTAD layer prepared by spin-coating (left) versus no pinholes when prepared by vacuum evaporation (right). The pinholes, identified by OIST’s Energy Materials and Surface Sciences Unit led by Prof. Yabing Qi, were described in the Chemistry of Materials earlier this year ("Air-Exposure Induced Dopant Redistribution and Energy Level Shifts in Spin-Coated Spiro-MeOTAD Films"). The pinholes in the top layer of the solar cell, known as the hole transport layer, were identified as a key cause for the quick degradation of perovskite solar cells. Researchers around the world are investigating the potential of perovskite, a manmade organic-inorganic hybrid material, as an alternative to silicon-based solar cells. The researchers eliminated the pinholes by using a different method to create the top layer of the solar cell, which is made of a material called spiro-OMeTAD. Instead of dissolving spiro-OMeTAD powder in a solution and then spin-coating it onto perovskite, they evaporated the powder in a vacuum chamber and the spiro-OMeTAD molecules deposited onto the solar cell. To create this layer, a solar cell is positioned upside down on the ceiling of a vacuum chamber. As the spiro-OMeTAD is heated up, it evaporates and the gas molecules that stick to the perovskite, creating an even layer -- much like when snow blankets the ground. Essentially, the spiro-OMeTAD molecules are snowing, but up rather than down. 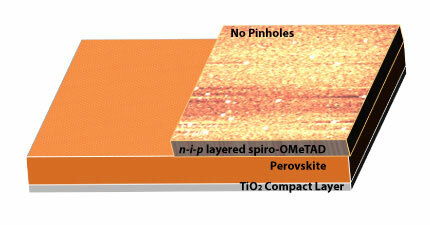 Many high-performance solar cells under development layer spiro-OMeTAD on top of perovskite, with other trace elements added to increase electrical conductivity. This method also enabled the team to precisely control how and when they added other ingredients to the mix to make it more conductive. The result again was a significant improvement – they could finely tune the energy level of that layer to closely match the layer beneath it, which makes the movement of “holes” carrying positive charges around the solar cell circuit much easier. “A very small difference between the top layer and perovskite material means maybe we get greater energy efficiency,” Jung said. The evaporation method also resulted in a much longer-lasting solar cell. Before, the cells would lose the ability to efficiently convert sunlight into electricity after a couple of days. Now, their efficiency remains high for more than 35 days. While cheaper than conventional silicon-based solar cells, evaporation-based perovskite solar cells are more expensive than spin-coated cells. The team is now working to determine how to strike a balance between cost and efficiency, and hopefully find a way to use solution processing without creating pinholes.